The pneumatic engine does not show any vibration on the shaft. allows for a non combustible "all condition" running unit for the fireman and national safety teams. It does run in heavy smoke or under water as well. Exhaust can even be respirated by the fireman ! Liquid nitrogen is somewhat a reject of the oxygen distillation process, and is consequently relatively affordable. 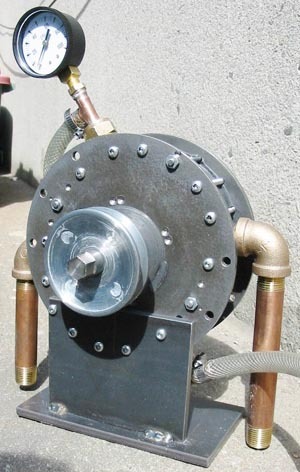 which can be the Quasiturbine itself (which then act as a "flash steam generator"). followed or not by an overheater (or overheating the Quasiturbine itself). The world of new ecological energy often consider sources 2 orders of magnitude under the petroleum. a gallon of liquid nitrogen contains only 10 to15 times less mechanical energy than a gallon of gasoline, and it is zero pollution ! without relying on isothermal expanders (which double the energy output). Gasoline mechanical energy is around 1 third (18% in transportation) of 9600 W-h/liter. (liquid nitrogen is pure mechanical energy, while gasoline is 1/3 mechanical, 2/3 thermal). This high performance cycle is specially simple to built, non polluant, and appear well suitable for mobile units. It does also fit very well the pure thermal sources, like the solar energy thermal conversion stations. is such that the exhaust temperature after expansion is equal to the ambient temperature ! Could give output of 50% increases or more. the condensation of moisture poses problem in the subsequent stages if mixed with the ambient air, problem what the use of a burner removes completely. Notice that the energy of the burner is later in the exhausts nitrogen heats, and that this energy is recovered by the vaporization of liquid nitrogen, the net contribution is thus transitory and small in steady state. The burner is in any case necessary in the vehicles of Nordic area to warm the cockpit! by replacing the evaporator by a Quasiturbine-Stirling mounted on the same shaft. As for the vapour, the effectiveness of the cycle is function of the ability overheat the gas. which reduces much the pressure of the bottle, but worse the cold gas increases density and consumes himself then too quickly. If the ambient conditions can provide free heat, it is much better, but overheating generally imposes a burner (hybrid). followed of a superheater of the gas (propane or other) right before the entry into the engine (Quasiturbine). The exhaust gas of the engine deprived of moisture gain to be injected near relaxation to avoid the frost. unless the heat is also stored in the tank at the time of compression (storage for short duration and low 10 bar - 150 psi). on compressed gases coming from a bottles at very high pressure. which reduces the volume of gases gradually and thus reduces the mechanical energy extracted. but not more than the total thermal bottle + the contribution. with reasonable Quasiturbine size (QT75SC), a differential of pressure from 50 to 100 psi is enough. which require a multi stages relaxation? The lower are the pressures, the better is the effectiveness!